Parmesan rind and a kitchen sink’s worth of aromatics give heady flavor to this classic pasta fagioli recipe with beans and pasta. Bring beans, Parmesan rind, carrots, celery, head of garlic, parsley, rosemary, bay leaves, chiles, and 2 quarts water to a boil in a medium pot. Reduce heat, cover, and simmer, adding more water as needed, until beans are tender, about 1½ hours. Season with salt and pepper, remove from heat, and let sit 30 minutes. Discard vegetables, rind, and herbs. Meanwhile, heat 3 Tbsp. oil in a large pot over medium. Cook onion and chopped garlic, stirring occasionally, until softened, 8–10 minutes. Add tomatoes, crushing with your hands, and cook, stirring often, until liquid is almost completely reduced, 12–15 minutes. Add wine, bring to a boil, and cook until almost completely evaporated, about 5 minutes. Add beans and their liquid; cook until flavors meld, 12–15 minutes. Add pasta; cook, stirring and adding more water as needed, until al dente, 15–20 minutes. Add escarole and cook until wilted, about 1 minute; season with salt and pepper. 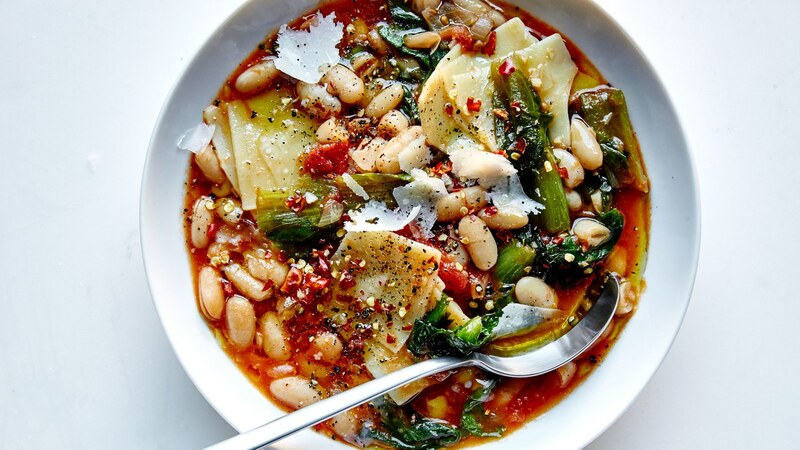 Serve soup drizzled with oil and topped with Parmesan and more chile.